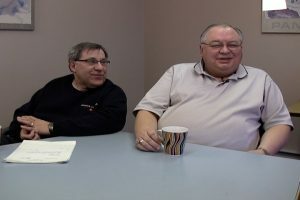 A product of Saskatchewan, Leo came to work for the City of Edmonton’s water and sanitation department in 1972, after graduating from NAIT with a diploma in civil engineering. Soon after starting work, he agreed to serve as shop steward, then Chief Steward. After this, he was elected Treasurer, a position he held over 12 years at the time of the Centennial. Gary came to Edmonton from a farm close to Myrnam, Alberta to enter NAIT where he received a diploma in architecture. After working in the private sector for a while, he came to work in the drainage department for the City of Edmonton in 1975. After serving as shop steward and on negotiating committees, he became a vice-president of the Union, a position he held at the time of the 100th Anniversary celebrations. Gary has vivid memories of the 1976 Strike which resulted in CSU breaking away from CUPE.